Choose a CSIA Certified Chimney Sweep. 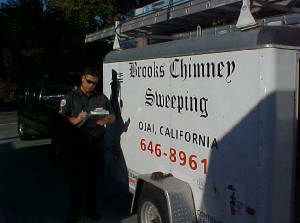 The chimney service trade is not regulated, nor are chimney sweeps licensed in The state of California. Further, opening a chimney service business requires a relatively small capital investment. 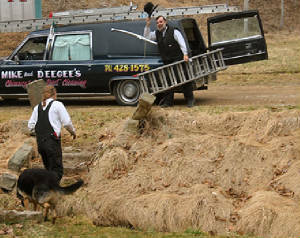 Thus, virtually anyone - without education, training, experience or even a working knowledge of proper tools or equipment can become a chimney sweep. As a result, many ill-equipped, ill-prepared individuals are free to offer their "services" to homeowners. More frequently, these individuals will take advantage of learning opportunities and become competent, knowledgable chimney sweeps. In other cases, they will continue along the same path they started on, offering incompetent service and, in some cases providing trusting homeowners with a false sense of well-being. For this very reason, a number of states are currently considering license requirements for chimney sweeps. As precursors to state licensing, some municipalities currently license chimney sweeps and in most of those, the criteria for licensing is the CSIA Certified Chimney Sweep credential. The CSIA Certified Chimney Sweep credential is the hallmark of excellence among chimney service professionals and among homeowners and related industry professionals who understand the quality and value it represents. Homeowners should be aware that there is only one legitimate national certification program for the chimney service industry and that is the CSIA program. Those who have earned the CSIA Certified Chimney Sweep credential have demonstrated their commitment to their industry, to fire prevention, and to the clientele they serve. CSIA Certified Chimney Sweeps pass an extensive examination on national codes and standards and agree to the CSIA Code of Ethics. We encourage all consumers to investigate any and all claims made in advertisements by chimney sweep companies. The CSIA logo is protected by its trademark and is frequently misused by misguided soles for personal gain. Simply click on the CSIA link, and enter your 5 digit zip code in the search engine, select a sweep from the list provided. Have confidence that all listed are currently CSIA certified. ...You dont know who might show up at your door?